Powers/Abilities: Razor-Fist's hands were both replaced with steel blades which he could use as weapons. History: (Master of Kung Fu I#29)- When Shang-Chi invaded Carlton Velcro's base, he dispatched Razor-Fist to "shake hands" with him. Razor-Fist assured Shang that he would appreciate Velcro's wit more fully once he met him-- one piece at a time! (Master of Kung Fu I#30)- Razor-Fist put up a furious battle against Shang-Chi, during which one of his blades was snapped off by Shang, blocking a slash with one of his wristbands. Finally, Shang-Chi managed to dodge one of his blows, causing him to wedge his remaining blade into a statue. Unable to pull himself free, Shang-Chi kicked him into the statue, knocking him out cold. 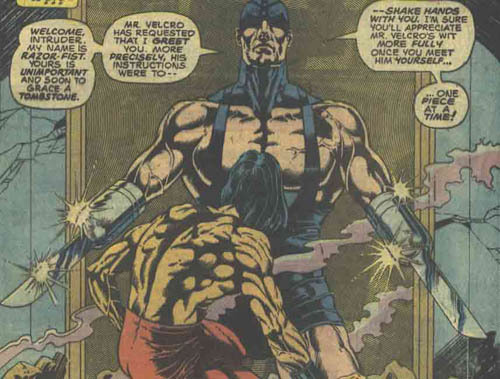 (Master of Kung Fu I#31)- After freeing himself, Razor-Fist attempted to continue his battle with Shang-Chi, but Velcro, who had Shang-Chi pinned down by his men, stated that he "no longer recognized" Razor-Fist because of his failure. Despite Razor-Fist's pleas that he could still kill Shang-Chi for him, he was gunned down on the spot. Comments: Created by Doug Moench and Paul Gulacy. Dr. Doom wielded two robot duplicates of Razor-Fist in Master of Kung Fu I#59-60. Pavane incorrectly assumed that all three Razor-Fists were related; in fact, only the second and third are brothers. His real name was revealed in the New Avengers: Most Wanted Files. A Razor-Fist was seen in JLA/Avengers#4, but since the characters in this story were pulled forward from different times, it could've been one of the others.